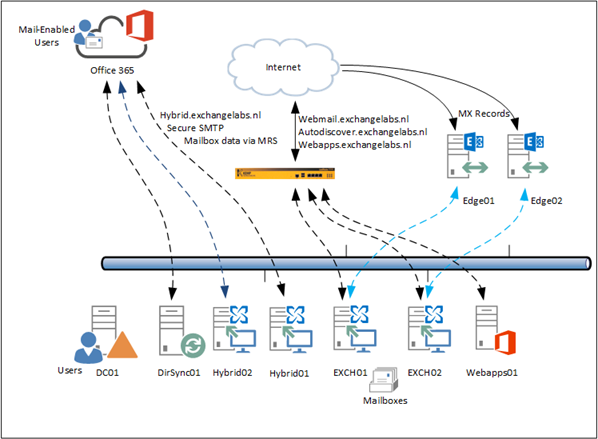 I’m running a coexistence scenario with Exchange 2013 and Exchange 2016 without too many issues. My hybrid server is running on Exchange 2013 from the beginning, and it is time to upgrade this server to Exchange 2016. If you have configured your Exchange environment correctly the hybrid server is nothing special. In my environment the hybrid server is just used for sending SMTP messages between Exchange Online and Exchange on-premises, and it is used for migrating Mailboxes back and forth. 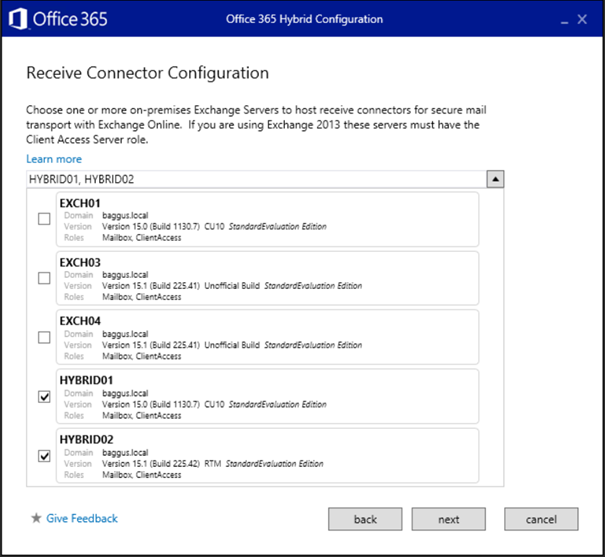 Upgrading the existing Exchange 2013 hybrid server to Exchange 2016 is actually just a matter of installing a new Exchange 2016 Mailbox server, configure it correctly like the old Exchange 2013 hybrid server and rerun the Hybrid Configuration Wizard application. Figure 2. 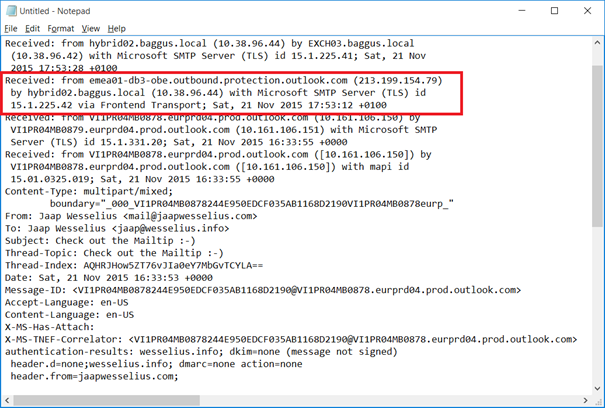 Bind the SSL certificate to the IIS and SMTP service. Configure the Virtual Directories on the new hybrid server. Use the webmail.contoso.com FQDN just as you would configure them on a regular Exchange 2016 server used for regular Exchange traffic. Do not use the hybrid.contoso.com FQDN for configuring the hybrid servers. When everything is installed and configured, you can run the Hybrid Configuration Wizard application. Open the Exchange Control Panel (either on-premises or online) and select Hybrid and download the application on the new server. Figure 3. 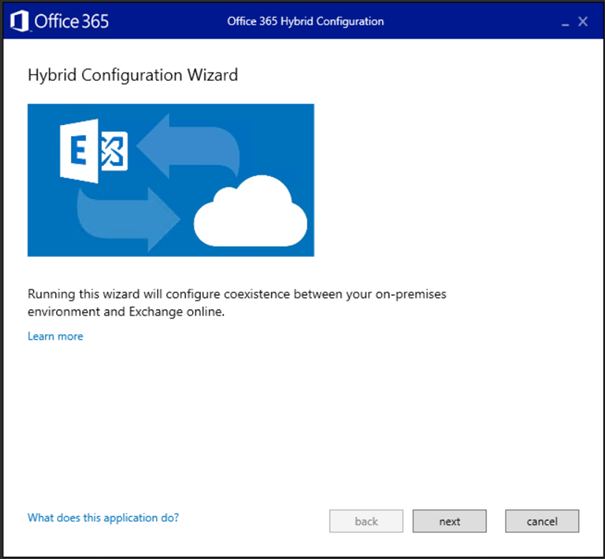 Download the Office 365 Hybrid Configuration Wizard application. 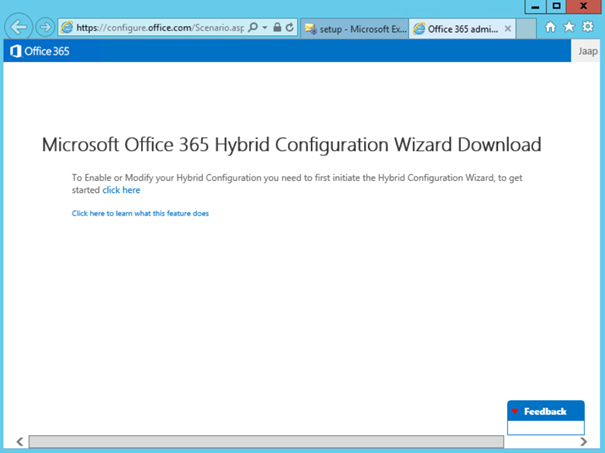 Follow the wizard and install the Hybrid Configuration Wizard application When installed it will automatically start. Figure 4. The Hybrid Configuration Wizard application will be started automatically. When running the application, it will automatically detect the new hybrid server, in our environment the server hybrid02 will be detected and selected automatically. Figure 5. The new hybrid server will be detected automatically. Two important steps in the Hybrid Configuration Wizard is the creation of the Send Connector and Receive Connector used with Exchange Online. The servers you select here will be used for SMTP communication between both environments. Since TLS for SMTP communications, a proper 3rd party SSL certificate needs to be installed as well. The old hybrid server is still selected, you have to select the new hybrid server and deselect the old hybrid server here. Figure 6. Select the new hybrid02 server for configuring the Receive Connector. The same is of course true for configuration of the Send Connector. Figure 7. Select the new hybrid02 server for configuring the Send Connector. Follow the wizard, and when all information that’s needed for proper configuration is selected click the Update button. The hybrid configuration in your on-premises environment will now be configured. When everything is configured and you check the Outbound to Office 365 Send Connector you’ll see that the new hybrid02 server is selected as a source server. Figure 8. When all is well the new server is configured as a Source Server for the Send Connector. Note. Do not forget to connect the new server (via Reverse Proxy?) to the Internet. 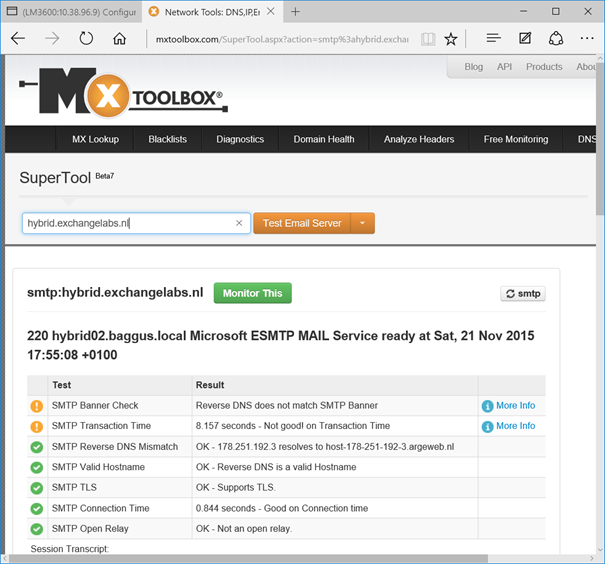 I normally use the MXTOOLBOX.COM toolset to check connectivity to my SMTP servers, and I do this for the new hybrid server as well. Enter the FQDN in the MXTOOLBOX and check the results. Figure 9. Use the MXTOOLBOX to check connectivity to the new hybrid server. 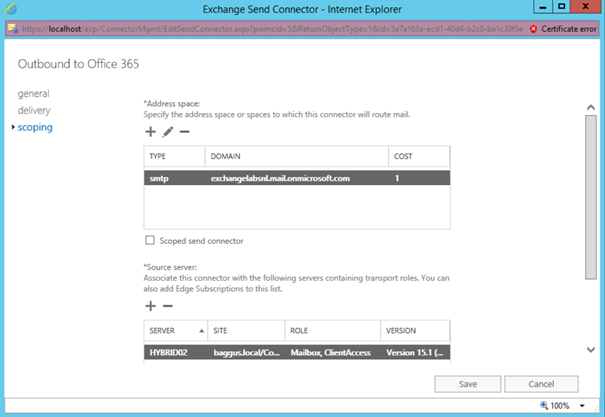 When sending an email from a Mailbox in Exchange Online to a Mailbox in Exchange on-premises you can check the header information once the message is received. If configured properly you should see mail flow between the two via the new hybrid server. Figure 10. Mail flow between on-premises and online is via the new hybrid server. The step that’s remaining is to uninstall the old Exchange 2013 hybrid server using Add/Remove programs (please don’t just turn it off). 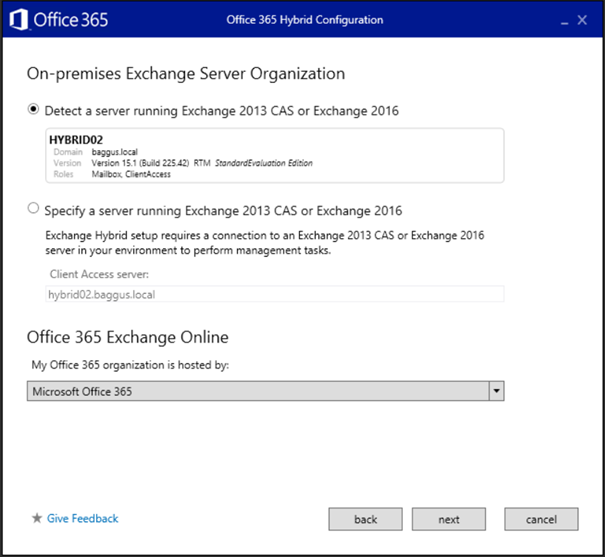 We’ve now upgraded the hybrid server from Exchange 2013 to Exchange 2016. Well, the hybrid server is just an ordinary Exchange server, so the regular upgrade process applies here as well. The upgrade from Exchange 2010 to Exchange 2016 is similar to the upgrade to Exchange 2013. Hi Jaap, thank you for the helpful walkthrough. I’m in the process of replacing a hybrid 2013 exchange server with a hybrid 2016 exchange server. What is the best process for me to move the existing 2013 mailbox databases to the 2016 server? I apparently need to get rid of the 2013 server completely as I have some shadow connectors still trying to send email on the old 2013 server and I assume that’s because the mailbox databases are located on that server. What I typically do is installing a new Exchange 2016, move mailboxes (if any, take care about arbitration mailboxes) to this new server, run the Hybrid Configuration Wizard and decommission the old Exchange 2013 server. This should resolve any potential issues. However, all customers have different configuration, so a guideline is very difficult to give.